Zululand is the ancestral home of the Zulu people. 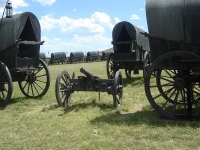 It is the site of many a bloody battle between the British, the Afrikaaners, and the Zulus during the 19th century, is best explored as a self-drive adventure, although many tours are available from Durban. Almost every town in this area of northern KwaZulu-Natal has a story to tell or an event to commemorate and tourism offices throughout the region provide maps and guides to assist visitors in making the most of the history, culture, scenery and wildlife. The landscape varies from plains to rolling hills, river valleys to lush forests. This land once encompassed the Zulu Kingdom led by legendary Shaka Zulu, who clashed with the British and the Boers (Afrikaaners) in many epic battles. Centre of the Zulu nation is the small town of Eshowe. King Shaka was born close to the town, and it was also the site of a 10-week siege during the Anglo-Zulu War of 1879. Other towns of note are Ladysmith and Dundee, near which were fought the historic battles of Rorke's Drift, Blood River, and Isandlwana. Some of the battlefields include museums or memorials and others are just open landscapes which visitors can stroll through, imagining the historic conflicts with the help of a good guide book.